"When my husband and I purchased our home, I couldn’t have been more thrilled about the opportunity of having a blank slate that we could turn into our light and airy oasis. Fast-forward to three years later and with the pending arrival of our now 4-month-old son; with great joy I set my sights on his nursery." There is nothing in this world that gets me as excited and fills my heart with as much joy as being creative. I come from a very creative and artistic family. My mom discovered her painting talent in her 40s, my aunt is an architect, my grandfather was a skilled carpenter and wood carver, our cousin Virgilije Nevjestic was one of Croatia’s most famous and prominent artists, and my brother was practically born with a pencil and paintbrush in his hand. While the artistic gene might have skipped me — I can’t draw or paint for the life of me — I have always looked for other outlets through which I can express the creative ideas that float around in my head. I always felt that I had an innate understanding of how colours, shapes and textures work together and the importance of light and balance. However, my brother was a great influence and source of technical knowledge for me as I developed and honed my skills in design, both graphic and interior. When my husband and I purchased our home, I couldn’t have been more thrilled about the opportunity of having a blank slate that we could turn into our light and airy oasis. Fast-forward to three years later and with the pending arrival of our now 4-month-old son; with great joy I set my sights on his nursery. On my way to work, which is about a 45 minute train ride into downtown Toronto, I came up with the whole concept and slowly started pulling pieces together. 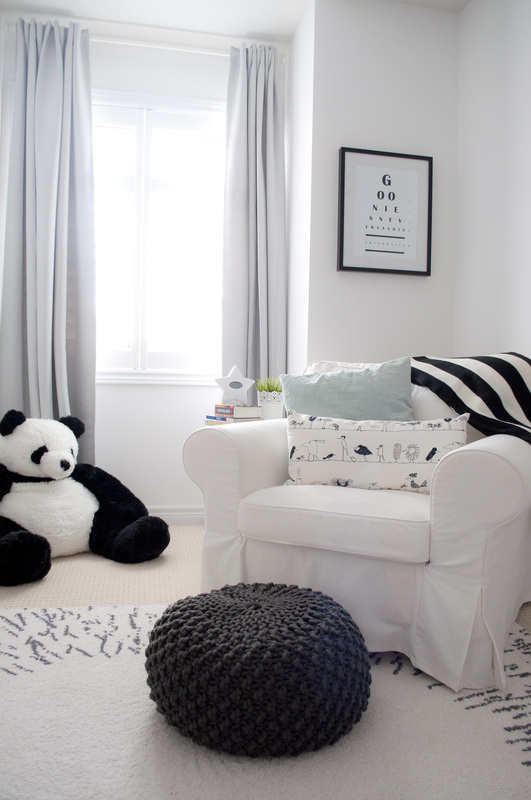 In comparison to my daughter’s room (which I will write about in an upcoming blog post), I wanted my son’s room to be very calm and crisp, with a simple monochrome colour theme. The idea really came from the giant panda I randomly found at a toy store in the city. 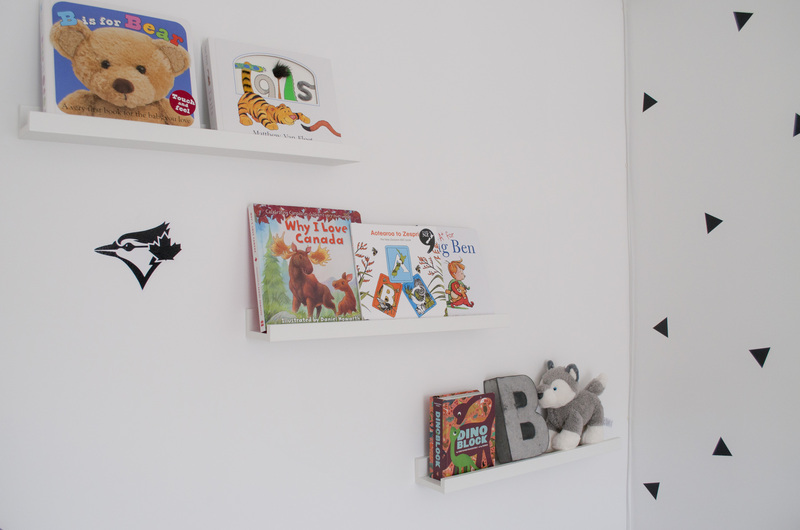 There are so many elements that I could talk about but I’d like to highlight the decal wall, the chalkboard wall and the amazing Etsy posters, which came out just amazingly. 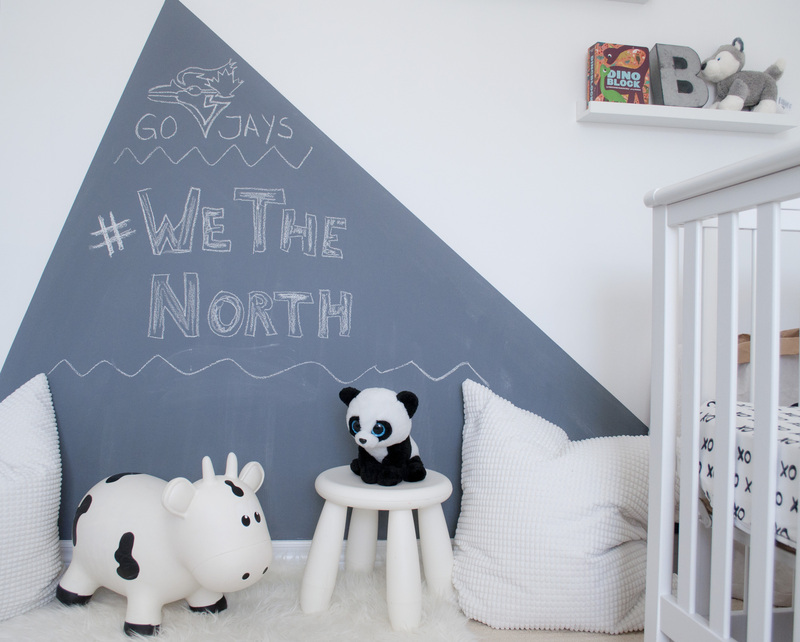 The triangle decal wall is from Urban Walls, a Canadian store specializing in all kinds of fun wall decals. They come in a variety of colours so they can work with your colour schemes. I obviously chose black to play up on the monochrome theme. The chalkboard wall is meant to complement the smaller triangle decals; except I chose a darker grey as I felt a black triangle that size would be a bit harsh to look at. My daughter is a frequent visitor in her brother’s nursery, as she likes to use the chalkboard. Finally, as a child of the 1980s I really will try my best to make my children love all the movies I did growing up, so I found this amazing “Goonies never say die” poster that I HAD to have. 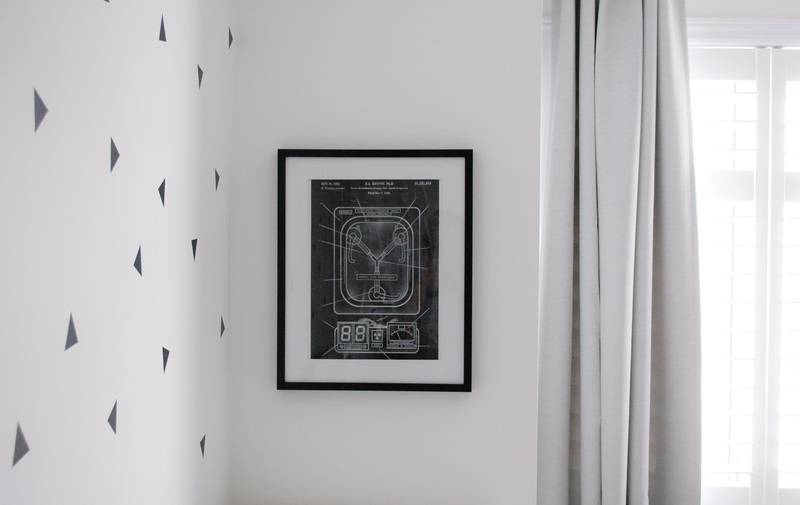 The second poster is Back To The Future and I could not be happier with how they fit in the space.